The New York Giants have waived defensive end Owamagbe Odighizuwa, who was suspended without pay for the first four games of the 2017 regular season for violating the NFL policy on performance enhancing substances. 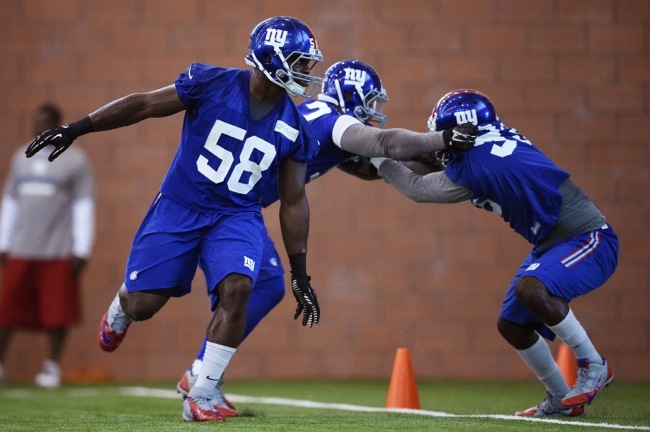 Drafted in the 3rd round of the 2015 NFL Draft by the Giants, Odighizuwa has not developed as hoped or expected. Hamstring and foot injuries caused him to miss 12 games of his rookie season. He missed two regular-season games in 2016 with a knee injury and the playoff game with a hamstring injury. In his 18 regular-season games, Odighizuwa has been credited with just six tackles and one pass defense. 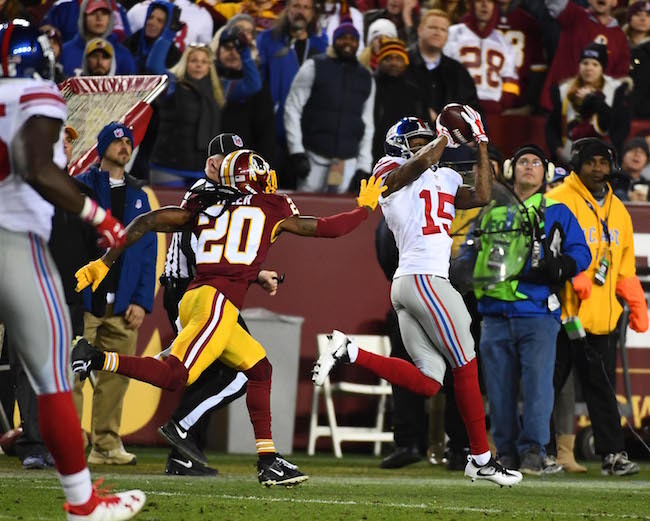 Wide receiver Odell Beckham, Jr. (ankle), wide receiver Tavarres King (ankle), defensive tackle Jay Bromley (sprained knee), linebacker Keenan Robinson (concussion), linebacker Mark Herzlich (burner), cornerback Eli Apple (ankle), cornerback Michael Hunter (concussion), and Duke Ihenacho (sprained knee) did not practice. “(Beckham) got some treatment, he’s in there taking care of himself, getting ready to go,” said Head Coach Ben McAdoo. There is no media availability to the team on Wednesday. The Giants play the Patriots in New England on Thursday night. New York Giants defensive end Owamagbe Odighizuwa has been suspended without pay for the first four games of the 2017 regular season for violating the NFL policy on performance enhancing substances. Odighizuwa will be eligible to return to the Giants active roster on Monday, October 2 following the team’s October 1 game against the Tampa Bay Buccaneers. Odighizuwa is eligible to participate in all remaining preseason practices and games. 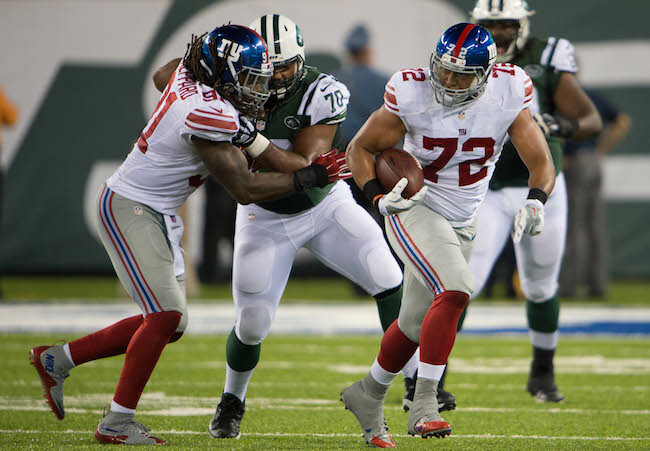 The New York Giants have placed offensive lineman Adam Gettis (foot) on Injured Reserve. The team also waived/injured defensive end Evan Schwan (broken foot). Both players were injured during the Giants-Jets game on Saturday. To fill these roster vacancies, the team claimed cornerback Tay Glover-Wright off of waivers from the Philadelphia Eagles and signed rookie free agent cornerback Daniel Gray. The 6’0”, 180-pound Glover-Wright was originally signed as an undrafted rookie free agent by the Atlanta Falcons after the 2014 NFL Draft. Glover-Wright has spent time with the Falcons (2014), Green Bay Packers (2014), Indianapolis Colts (2015-2016), and Eagles (2017), but he has only played in two NFL games (both in 2015). The 5’10”, 190-pound Gray was originally signed as an undrafted rookie free agent by the Arizona Cardinals after the 2017 NFL Draft. The Cardinals waived him last week. 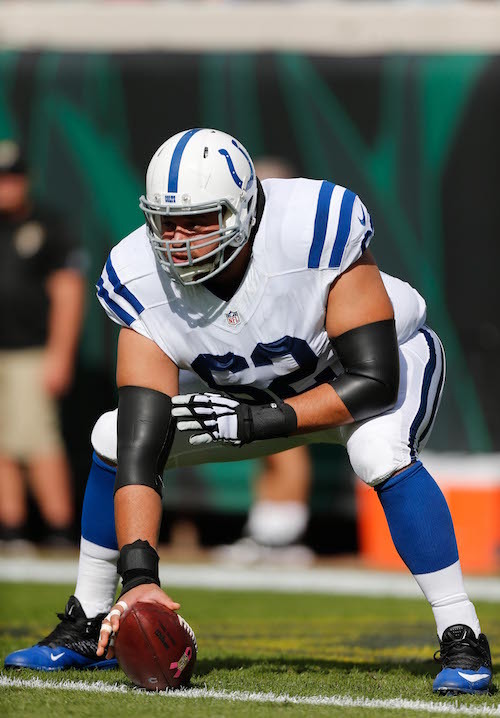 Gettis spent the bulk of the 2016 season on the Practice Squad, but he did play in three games with one start at left guard, performing admirably. Gettis was originally drafted in the 5th round of the 2012 NFL Draft by the Washington Redskins. He has spent time with the Redskins (2012-2013), Steelers (2014), Giants (2014-2015), Raiders (2015), and Giants again (2015-2016). Gettis has played in 17 regular-season games with one start. Schwan was signed by the Giants as an undrafted rookie free agent after the 2017 NFL Draft. Wide receiver Odell Beckham, Jr. (ankle), wide receiver Tavarres King (ankle), defensive tackle Damon Harrison (rest day), defensive tackle Jay Bromley (sprained knee), linebacker Keenan Robinson (concussion), linebacker Mark Herzlich (burner), cornerback Eli Apple (ankle), cornerback Michael Hunter (concussion), and Duke Ihenacho (sprained knee) did not practice. Wide receivers Brandon Marshall (shoulder) and Dwayne Harris (upper body) returned to practice. It was determined that running back Shaun Draughn did not suffer a concussion in the Jets game. He practiced. The New York Giants practice on Tuesday at 11:20AM. 2016 YEAR IN REVIEW: The New York Giants defensive line underwent a major overhaul in 2016, and the changes were perhaps THE major reason why the team’s defense improved from dead last in the NFL to 10th in terms of yardage and 2nd in terms of points allowed. The Giants went from 24th in run defense in 2015 (121.4 yards per game, 4.4 yards per carry) to 3rd in 2016 (88.6 yards per game, 3.6 yards per carry). The key to sparking the dramatic turnaround were the high-priced, high-profile free agent additions of defensive end Olivier Vernon (5-years, $85 million) and defensive tackle Damon Harrison (5-years, $46 million). These two were a major upgrade over defensive ends Robert Ayers/George Selvie and defensive tackles Markus Kuhn/Cullen Jenkins. Harrison is arguably the best run-stuffing defensive tackle in the game and earned first-team All-Pro honors after making the switch from a 3-4 nose tackle with the New York Jets to a 4-3 defensive tackle. Vernon was slowed by a serious hand/wrist injury but played virtually every snap and earned second-team All-Pro honors. Jason Pierre-Paul (JPP) rebounded nicely from a 2015 offseason catastrophic fireworks accident that left him permanently maimed. 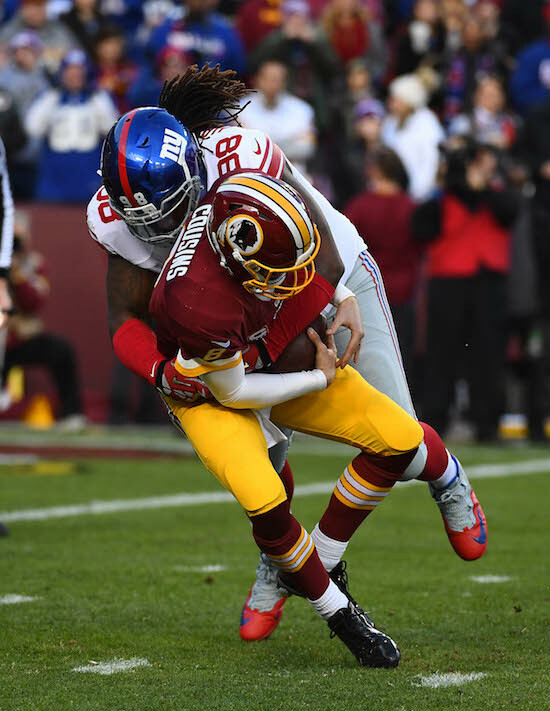 After a slow start on the pass-rushing front, the line was rounding into peak form until a groin tear/sports hernia injury sidelined JPP for the final four regular-season games and post-season contest. Unfortunately, the dropoff was noticeable. As a unit, the line finished with 24.5 sacks in the regular season (up from 16 in 2015). ADDITIONS/SUBTRACTIONS: The Giants’ biggest personnel loss in the offseason was DT Johnathan Hankins signing a 3-year, $30 million contract with the Colts. The team did re-sign DE Jason Pierre-Paul to a 4-year, $62 million deal. The Giants also re-signed exclusive rights free agent DT Robert Thomas, restricted free agent DE Kerry Wynn, and practice squader DE Jordan Williams. New additions include veteran free agents DE Devin Taylor and DT Corbin Bryant as well as rookies DT Dalvin Tomlinson (2nd round), DE Avery Moss (5th round), DE Evan Schwan (undrafted free agent), and DT Josh Banks (undrafted free agent). 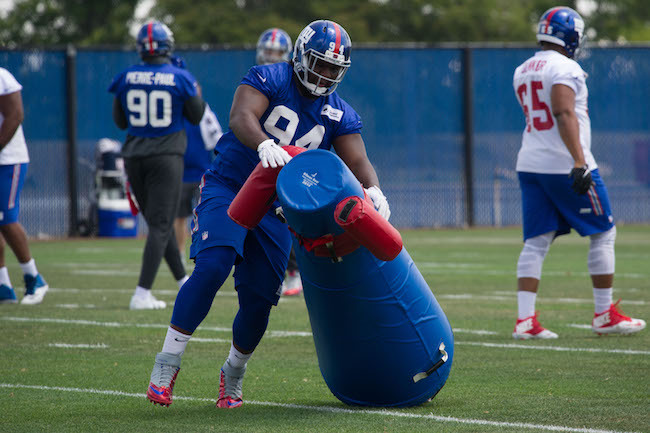 TRAINING CAMP STORY LINES: One of the most significant story lines for the team is can the Giants adequately fill the shoes of Johnathan Hankins at defensive tackle? While Damon Harrison quickly became the headliner at defensive tackle for the Giants, Hankins was an important part of the drastically-improved New York Giants run defense. Many believe Dalvin Tomlinson will automatically assume the starting position, but Tomlinson is a rookie and will face challenges from veterans Robert Thomas, Jay Bromley, and Corbin Bryant. Depth is also a cause for concern as Harrison must now be considered one of the most indispensable players on the team. Heaven help the Giants if he gets hurt. ON THE BUBBLE: Everyone except Jason Pierre-Paul, Olivier Vernon, Damon Harrison, and Dalvin Tomlinson. PREDICTIONS: Dalvin Tomlinson is one of the few defensive tackles who realistically could come in and adequately replace Johnathan Hankins as a rookie. He not only has the physical tools, but he is a super-smart guy who played on the big stage at Alabama. Nevertheless, keep an eye on Robert Thomas, who may split snaps with him. Competition for roster spots will be fierce as the Giants added a couple of former veteran starters late in free agency (Devin Taylor and Corbin Bryant). The Giants can’t keep all of these guys and linemen who can play in this league are going to be released. Another player to keep tabs on is Avery Moss. The coaches and players have said nice things about him and the Giants are still looking for that third pass rusher. FINAL DEPTH CHART: Jason Pierre-Paul, Olivier Vernon, Damon Harrison, Dalvin Tomlinson, Romeo Okwara, Avery Moss, Devin Taylor, Robert Thomas, and Corbin Bryant. (The Giants hate to part ways with draft picks so it would not be shocking to see Owa Odighizuwa and Jay Bromley make it over late FA additions Taylor and Bryant. I would also not count out Kerry Wynn). The team’s OTAs will be held on May 22-23, May 25, May 30-31, June 2, June 5-6, and June 8-9. A mandatory mini-camp will be held on June 13-15. Owa Odighizuwa was at Giants facility Tuesday for start of offseason workout program two weeks after hinting of taking break from football. New York Giants restricted free agent defensive end Kerry Wynn has signed his 1-year, $1.797 million tender. Wynn was the only Giants restricted free agent who was tendered. (Running back Orleans Darkwa was not tendered but re-signed). Wynn visited the New England Patriots last week. Wynn saw his playing time decrease in 2016 (11 percent of defensive snaps). He played in 14 regular-season games with no starts and finished the year with 12 tackles and 0.5 sacks. Wynn was originally signed as an undrafted rookie free agent by the Giants after the 2014 NFL Draft. He has played in 34 regular-season games, with seven starts, for the Giants in his three years with the team. Wynn has a nice combination of size, strength, and overall athletic ability. Wynn is a better run defender than pass rusher as he lacks dynamic quickness on the outside pass rush. He is able to play defensive tackle in pass-rush situations. 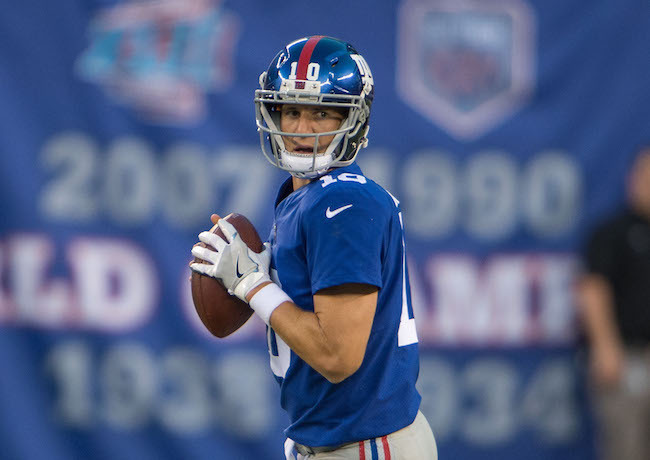 New York Giants quarterback Eli Manning held his annual unofficial passing camp at Duke University this week. 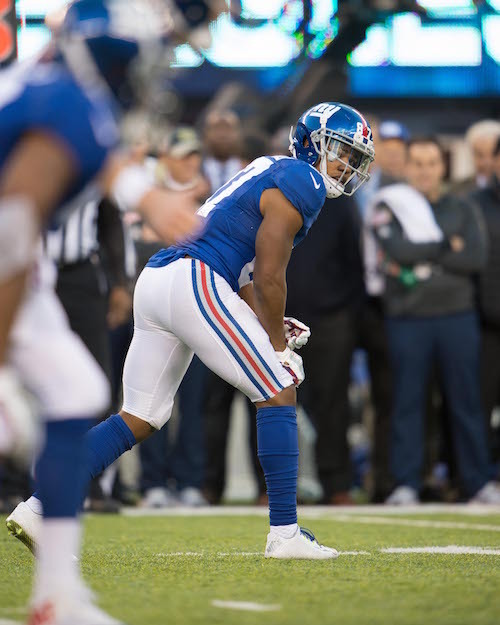 Those who attended reportedly included wide receivers Brandon Marshall, Sterling Shepard, Tavarres King, and Roger Lewis; tight ends Rhett Ellison, Will Tye, and Jerell Adams; running back Shaun Draughn; and quarterback Josh Johnson. Wide receiver Odell Beckham, Jr. did not attend this year due to oral surgery. Manning told The New York Post that he is impressed with Marshall, who the Giants signed in free agency after he was cut by the New York Jets. “I think Plaxico (Burress) was kind of the last one similar to that size,” said Manning. “They can be open when they’re not really open. You don’t want to get into a habit, it’s not a jump-ball but you can throw him open. He’s been in lots of offenses and he gets open a lot of different ways, very disciplined in his route-running and understanding concepts. I think he’ll be good for that receiver room and in our locker room, having that veteran presence. The workouts are overseen by current Duke University head football coach David Cutcliffe, who was Eli Manning’s head coach at the University of Mississippi from 2000 to 2003. The program consists of on-field work that lasts two and a half hours per day, split into two sessions. The players also do strength and film work. For years, Cutcliffe has coached Manning on his fundamentals, including footwork and throwing motion. The transcript of Thursday’s BBI draft chat with Colin of the Great Blue North Draft Report is available in The Corner Forum section of the website. We have updated the important upcoming dates section of the website. Is Owamagbe Odighizuwa Retiring from Football? I have all love for everyone.. at the point and time I believe it’s in my best interest to take sometime to get away from the game. However this is the best platform to express something of the things that has been on my mind for a while. I truly apologize that it has to be made known like this. Drafted in the 3rd round of the 2015 NFL Draft by the Giants, Odighizuwa has not developed as hoped or expected. Hamstring and foot injuries caused him to miss 12 games of his rookie season. He missed two regular-season games in 2016 with a knee injury and the playoff game with a hamstring injury. In his 18 regular-season games, Odighizuwa has been credited with just six tackles and one pass defense. Odighizuwa looks the part. He is a strong, well-built, and athletic defensive end with long arms and huge hands. Odighizuwa has the ability to play defensive tackle in pass rushing situations. He is a hard worker who simply has not been able to put it together yet. The New York Giants defensive line underwent a major overhaul in 2016, and the changes were perhaps THE major reason why the team’s defense improved from dead last in the NFL to 10th in terms of yardage and 2nd in terms of points allowed. The Giants went from 24th in run defense in 2015 (121.4 yards per game, 4.4 yards per carry) to 3rd in 2016 (88.6 yards per game, 3.6 yards per carry). In his first season with the Giants, Olivier Vernon was slowed early by a serious left hand/wrist injury but he ended up starting every game and playing 94 percent of all defensive snaps. Vernon finished with 63 tackles, 8.5 sacks, and one forced fumble. He was also named second-team All-Pro. Vernon was originally drafted in the 3rd round of the 2012 NFL Draft by the Dolphins. The Giants signed him as a free agent in March 2016. Vernon lacks classic size, but he is a very strong, athletic end with long arms and a non-stop motor. He is one of the better two-way ends in football and is equally disruptive against the run and the pass. Vernon can get heat on the quarterback from both the end and tackle positions, and gets a lot of hits on the quarterback. Jason Pierre-Paul started 12 games in 2016, but missed the remainder of the season with groin and sports hernia injuries that required surgery. He finished the year with 53 tackles, seven sacks, eight pass defenses, and three forced fumbles. Pierre-Paul was drafted in the 1st round of the 2010 NFL Draft by the Giants. His best season came in 2011 when he accrued 86 tackles and 16.5 sacks. After not missing a game in his first three years with the Giants, Pierre-Paul has not completed a full season in three of the last four years, including 2013 (herniated disc and shoulder injuries) and 2015 (fireworks accident that permanently maimed his right hand). Pierre-Paul has an excellent combination of size, strength, and athleticism. When healthy and focused, Pierre-Paul can be an explosive, disruptive difference-maker against both the run and the pass. His tremendous wingspan helps him to bat passes down at the line of scrimmage (42 career pass defenses and 2 interceptions). As a pass rusher, he can beat blockers with both power and movement skills. Pierre-Paul is a very good run defender, both at the point-of-attack as well as in backside pursuit. In his first season with the Giants, Damon Harrison had a superb year, starting every game and finishing the regular season with career highs in tackles (86) and sacks (2.5). Harrison was named first-team All-Pro. Harrison was originally signed as an undrafted rookie free agent by the Jets after the 2012 NFL Draft. The Giants signed him as an unrestricted free agent in March 2016. Harrison is a strong, mammoth player with surprising athleticism for someone so large. He is a rock against the run, able to hold the point-of-attack against the double-team block. He may be the NFL’s best inside run defender. Though Harrison is a better run defender than pass rusher, he will flash at times getting after the quarterback. Johnathan Hankins started every game and finished the 2016 regular season with 43 tackles, three sacks, and one forced fumble. Hankins was drafted in the 2nd round of the 2013 NFL Draft by the Giants. Hankins has excellent size, strength, and overall athleticism. He is a stout run defender who occasionally flashes on the pass rush. The Giants signed Romeo Okwara as an undrafted free agent after the 2016 NFL Draft. Not only did he make the team, but he was a surprisingly-strong contributor as a rookie. Okwara played in every game with four regular-season starts (36 percent of defensive snaps), and finished the year with 25 tackles, one sack, and two pass defenses. Okwara looks the part with excellent size and arm length. He’s a hard worker with a fine motor. While Okwara is a good athlete, he lacks dynamic quickness to excel as outside pass rusher. He flashes more when rushing from the defensive tackle position. Okwara is a solid run defender, but he can still improve his consistency in this area. 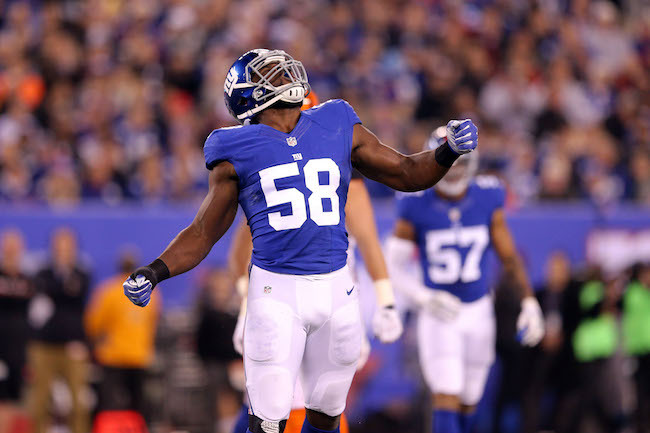 Drafted in the 3rd round of the 2015 NFL Draft by the Giants, Owamagbe Odighizuwa’s has not developed as hoped or expected. Hamstring and foot injuries caused him to miss 12 games of his rookie season. He missed two regular-season games in 2016 with a knee injury and the playoff game with a hamstring injury. In his 18 regular-season games, Odighizuwa has been credited with just six tackles and one pass defense. Odighizuwa looks the part. He is a strong, well-built, and athletic defensive end with long arms and huge hands. Odighizuwa has the ability to play defensive tackle in pass rushing situations. He is a hard worker who simply has not been able to put it together yet. Kerry Wynn saw his playing time decrease in 2016 (11 percent of defensive snaps). He played in 14 regular-season games with no starts and finished the year with 12 tackles and 0.5 sacks. Wynn was originally signed as an undrafted rookie free agent by the Giants after the 2014 NFL Draft. He has played in 34 regular-season games, with seven starts, for the Giants in his three years with the team. Wynn has a nice combination of size, strength, and overall athletic ability. Wynn is a better run defender than pass rusher as he lacks dynamic quickness on the outside pass rush. He is able to play defensive tackle in pass-rush situations. The primary reserve at defensive tackle, Jay Bromley played in 15 regular-season games with no starts. He received 22 percent of defensive snaps and finished the season with 14 tackles and one sack. Bromley was originally drafted in the 3rd round of the 2014 NFL Draft by the Giants. He has played in 39 regular-season games with just four starts. Bromley combines decent size, strength, and overall athletic ability. He has improved his play against the run since coming to the Giants but he has not developed into the inside pass rusher hoped for when he was drafted. The Giants claimed Robert Thomas off of waivers from the Carolina Panthers in September 2016. He played in eight regular-season games with no starts (6 percent of defensive snaps) and finished the year with five tackles and one sack. Thomas was originally signed as an undrafted rookie free agent by the Washington Redskins after the 2014 NFL Draft. He has spent time with the Redskins (2014-15), Seahawks (2015), Patriots (2015), Dolphins (2015), and Panthers (2016). Thomas is a big, strong tackle who plays hard. Stansly Maponga was signed to the Practice Squad in September 2016. Maponga was originally drafted in the 5th round of the 2013 NFL Draft by the Atlanta Falcons. From 2013-2014, he played in 24 regular-season games with no starts, accruing eight tackles, one sack, and two fumble recoveries. The Falcons waived Maponga before the start of the 2015 season. The Giants signed Maponga off of the Practice Squad of the Falcons in December 2015, and he ended up playing in two games for New York. Maponga is an athletic lineman who flashes on occasion as a pass rusher. Jordan Williams was signed to the Practice Squad in December 2016. Williams was originally signed by the New York Jets as an undrafted rookie free agent after the 2015 NFL Draft. He has spent time with the Jets (2015) and Miami Dolphins (2015-2016). He has good size. 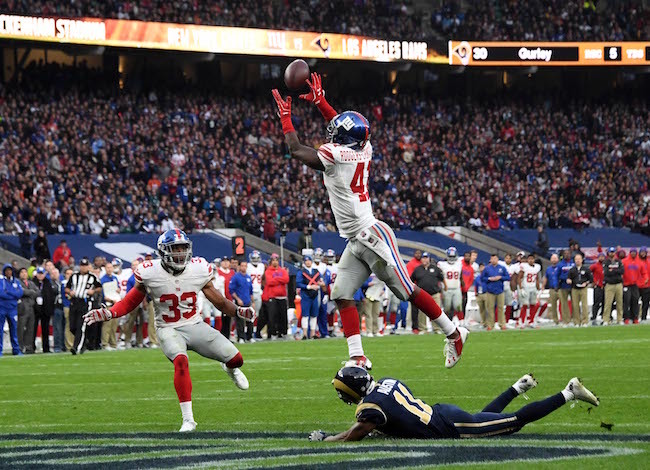 The New York Giants defeated the Los Angeles Rams 17-10 in a defensive struggle in London, England on Sunday. With the victory, the Giants improved their overall record to 4-3 heading into their bye week. The Giants offense was dreadful as New York was held to 13 first downs, 232 total net yards, 196 net yards passing, and 36 net yards rushing. The Giants were only 4-of-13 (31 percent) on 3rd down conversion attempts and only held the ball for just under 25 minutes. The Giants defense won the day, intercepting four passes (including one for a touchdown), sacking Rams quarterback Case Keenum three times, and holding Los Angeles to only 10 points. Like last week, the game started off very poorly for the Giants as New York quickly fell behind 10-0 in the first quarter. On the Giants second offensive snap, tight end Larry Donnell fumbled the ball away at the New York 35-yard line. Seven plays later, Keenum threw a 10-yard touchdown pass on 3rd-and-6. The Giants punted the ball away after picking up one first down on their second drive. Los Angeles then gained 62 yards in eight plays to set up a successful 36-yard field goal. These were the last points the Rams would score on the day. After both teams exchanged punts, the Giants offense managed to put together its longest drive of the game, marching 71 yards in 14 plays to set up a 29-yard field goal by place kicker Robbie Gould. No other Giants drive on Sunday would gain more than 37 yards. The Giants tied the game on the ensuing Rams possession. Keenum’s pass was deflected off of the hands of wide receiver Tavon Austin. Safety Landon Collins intercepted the pass and scored from 44 yards out on a spectacular interception return. Mid-way through the second quarter, the game was tied at 10-10. Neither team would score for the rest of the half as the Rams punted the ball away three more times and the Giants twice. Both teams continued to struggle on offense in the second half. The Rams and Giants each punted the ball away on their first three drives after intermission. The big break came in the 4th quarter when Keenum threw his second interception of the game. Linebacker Keenan Robinson deflected a pass that Landon Collins intercepted and returned to the Los Angeles 35-yard line. Facing a 3rd-and-3, quarterback Eli Manning found wide receiver Odell Beckham for a 22-yard gain down to the Rams 6-yard line. Three plays later, on 3rd-and-goal, running back Rashad Jennings scored from a yard out to give the Giants a 17-10 lead. The Rams drove to the Giants 37-yard line on their ensuing possession, converting on a 3rd-and-22. But with just over four minutes to play, cornerback Dominique Rodgers-Cromartie intercepted Keenum in the end zone for a touchback. The Giants went three-and-out on offense, giving the Rams one more chance with three minutes left in the game. After converting on a 4th-and-10, Los Angeles reached the Giants 15-yard line, but on 3rd-and-10, Rodgers-Cromartie intercepted Keenum in the end zone again to preserve the win. Offensively, Eli Manning was 24-of-37 for 196 yards, 0 touchdowns, and 0 interceptions. His leading receiving targets were wide receivers Victor Cruz (5 catches for 55 yards), Odell Beckham (5 catches for 49 yards), and Sterling Shepard (5 catches for 32 yards). Running backs Rashad Jennings was the team’s leading rusher with 13 carries for only 25 yards. Defensively, both Landon Collins and and Dominique Rodgers-Cromartie each had two interceptions. Defensive tackles Damon Harrison and Jay Bromley each had sacks, and defensive ends Jason Pierre-Paul and Kerry Wynn split a sack. Inactive for the game were safety Darian Thompson (foot), safety Nat Berhe (concussion), offensive tackle Marshall Newhouse (calf), wide receiver Tavarres King, defensive tackle Robert Thomas, linebacker Deontae Skinner, and quarterback Josh Johnson. In the game, wide receiver/returner Dwayne Harris injured his lower back but returned.